In this 5-day intensive figurative painting workshop, students will have the opportunity to explore the animate qualities of oil paint in representing the human body within a contemporary context. The workshop will begin with sketches of the students’ ideas. These will be loose, gestural drawings of the overall ideas the students wish to execute. These sketches will include portions of the anatomical body (legs, eyes, ears, face, stomachs, etc.). Dorielle will be taking reference photos and will also have images to work from. The idea is that the students will learn how to set beautifully-painted aspects of the figure in a dream-like setting filled with color, texture, symbolism, light, and hopefully, a psychological reveal. 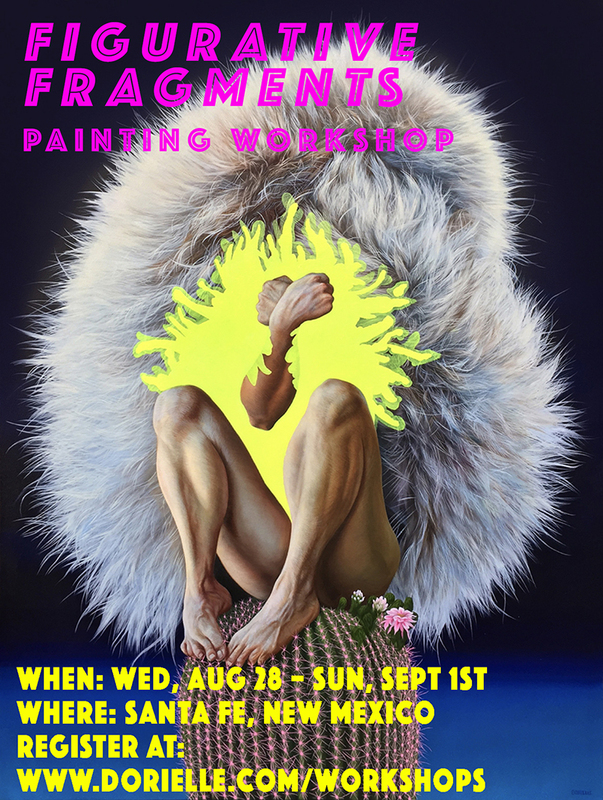 The goals of this workshop are to educate students to hone their abilities to see and paint representationally, as well as to help them delve into the complexities and transcendent possibilities of contemporary painting. NOTE: Santa Fe has an incredible art store called Artisan Santa Fe. You can get most of your supplies here if you need to. It is not permitted to fly with solvent, so I will have solvent here. -CANVAS (size suggestion: approximately 30" x 24") NOTE: please arrange a way to transport your painting home bearing in mind that they will be wet. A re-sealable "Masterson" palette lined with glass is what I use. I recommend it because you can put it in the freezer and keep your paints workable for weeks.